Perfect house for families or friends. To enjoy its tranquility next to the Baztan river and between the bridges of Txokoto and Opoca, with views and a great balcony overlooking the river. Spacious living room with a cozy fireplace. Spacious rooms and bathrooms renovated. WiFi connection. There is also an area on the lower floor of the building for sports and leisure, Pin-pong table, exercise bike, tapes, games .. In the vicinity there are several bar-restaurants to enjoy the cuisine of the Baztan Valley, with its typical casseroles, meat or homemade desserts as rich, in addition to our magnificent well-known bakeries. The house is perfect to spend a few days visiting the Baztan Valley and its surroundings. 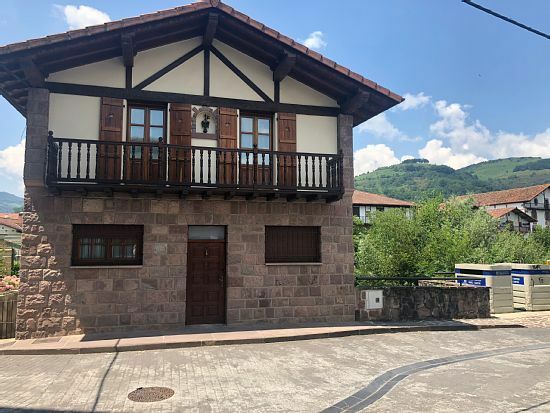 In the center of Elizondo, but in a quiet area, it offers views of the river and the house of Aunt Engraxi, for those who have read the Baztan trilogy by Dolores Redondo. Its large stone fireplace in the dining room is what characterizes it, making it perfect also for winter. It has two fully renovated bathrooms with hair dryer. And there is internet connection throughout the house via wifi. On the lower floor there is an entertainment room with table tennis, children's stories and a stationary bicycle and a ribbon for the most athletic. Una gran casa muy bien equipada y muy bien situada en el centro de Elizondo. Una buenísima opción para alojarse en el valle de Baztan. El trato con el propietario ha sido inmejorable por lo que tenemos intención de volver.